Ronald Ross was an India-born Nobel laureate noted for his outstanding work in the field of medicine. He was awarded Nobel Prize in 1902 for his work on the life cycle of malarial parasite and transmission of malaria, a disease which was considered as fatal and incurable in those days. He identified the malarial parasite in the gastro intestinal tract of mosquitoes in 1897 and the mosquitoes with malarial parasite embedded in their body were convincingly found by him to have the feature of propagating the disease. This formed the basis for creating medicines for preventing the disease and it has proved to be a phenomenal discovery worldwide. Ronald Ross was born in Almora of the then northwest Nepal province in British India (presently in Uttarakhand). He was born on May 13, 1857 to Sir C.C.G.Ross who was a General in the British Army. Ronald Ross was sent to England for his primary education. His initial personal penchant in studies was quite different from what he later became internationally famous for. During his childhood, he had evinced interest in poetry, music, literature and mathematics. He shined remarkably in different streams of academics and co-curricular activities. An award for excelling in mathematics was won by him when he was 14 years of age and he was very much influenced by a book titled “Orbs of Heaven” on mathematics. When he turned 16 in 1873, he won first prize in drawing in the Oxford and Cambridge Examination. In spite of his predilection for literature, his father fetched him admission in Bartholomew's Hospital Medical College in London, in 1874. Although he was not initially fully serious in medical sciences spending most of his time writing poems and plays, composing music he was able to pass the examinations for the Royal College of Surgeons of England in 1879. Later, he obtained a Diploma in public health from the Royal College of Physicians and Royal College of Surgeons. From 1881 onwards, he was posted at several places in India, Burma and Baluchistan. The main period of his study on malaria was from 1881 to 1891. After his work on malaria in Kolkata at the Presidency General Hospital, during his tenure as an Acting Garrison Surgeon in Bangalore, he understood that control of mosquito access to water helped in checking of malaria. When he fell ill with malaria in 1897 while working in Ooty he was transferred to Secunderabad where he identified the presence of malarial parasite in a specific species of mosquitoes, called anopheles. He found out that the disease spread from malaria-infected birds to healthy birds by the bite of female mosquitoes. He even confirmed the presence of malarial parasite in the saliva of female anopheles mosquito. Ronald Ross was sent back to England in 1899 where he worked as a professor of tropical medicine in Liverpool School of Tropical Medicine. He became in 1901 a fellow of the Royal College of Surgeons and also a fellow of Royal Society. 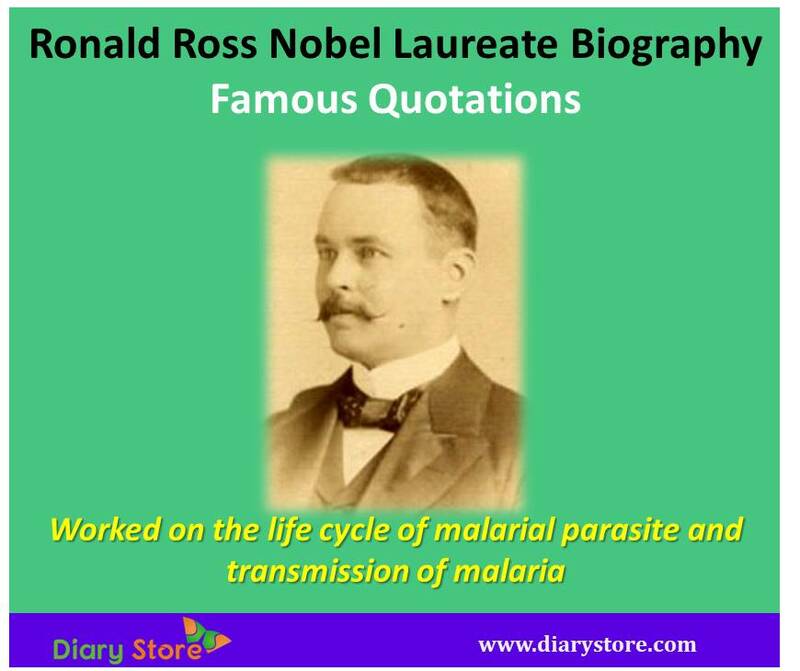 Ronald Ross received Nobel Prize in 1902 for his remarkable study on the life-cycle of malarial parasite. The same year, he was appointed a Companion of the most honorable “Order of Bath” by King Edward VII and he was promoted to the rank of Knight Commander of the same order in 1911. He was also elected Vice President of Royal Society in the same year and he held the position for three years. Ronald Ross took active participation in prevention of malaria across the world, especially in Mauritius, Greece, Cyprus, the Suez Canal zone in the West Africa and in the areas affected by the repercussions of World War I. He set up organizations for prevention of malaria in India and Sri Lanka (the erstwhile Ceylon). In addition to being a renowned medical scientist, he submitted scientific papers on mathematics to Royal Society which published them in 1915 and 1916. His work on mathematics revealed his profound knowledge in pure and applied fields and he developed mathematical models in curbing propagation of malaria. 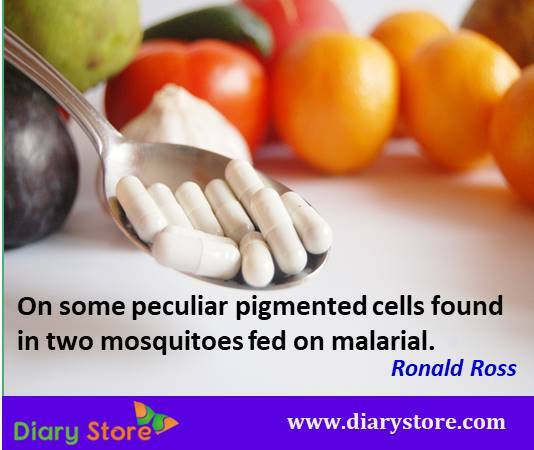 On some peculiar pigmented cells found in two mosquitoes fed on malarial. The belief is growing on me that the disease is communicated by the bite of the mosquito... She always injects a small quantity of fluid with her bite - what if the parasites get into the system in this manner. The World requires at least ten years to understand a new idea, however important or simple it may be. Science is the Differential Calculus of the mind. Art the Integral Calculus; they may be beautiful when apart, but are greatest only when combined. The belief is growing on me that the disease is communicated by the bite of the mosquito. ... She always injects a small quantity of fluid with her bite-what if the parasites get into the system in this manner. I have failed in finding parasites in mosquitoes fed on malaria patients, but perhaps I am not using the proper kind of mosquito. Wall Street's favorite scam is pretending that luck is skill.